Above you can see a short video of what I consider the most technically advanced game made for the atari 2600. Notice the copyright. 1986. by Douglas Neubauer. The Nintendo was already out. The video game market had already crashed and was on it's way to being rebuilt. The problem was that the 16k rom bank switched cartridge technology did not come out till the end of the 2600 heyday. This did not change the capability of the original 2600, but it changed the variety of graphics that could be displayed. But this game manages to squeeze out every bit of graphic trickery with horizontal scrolling. 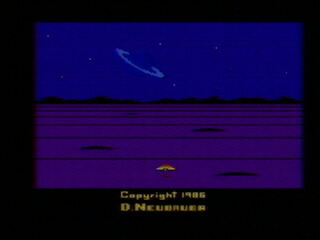 And if more games would have been like this the Atari would have lasted 2 or 3 more years. I did not get this game until 1998 when it was in a box of carts bought for 5 dollars at a yard sale. I was in awe the first time I played it. And thanks to digital press and the DP collectors CD I even have the instructions. I must say the emulated version is good but it does not compare to the real thing. And in case you didn't notice the theme of this website is made from Solaris graphics. How much do you think this game is worth today? How much if it came with the original box and instructions? 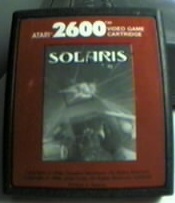 What is it was unopened :) You can get Solaris and several other brand new 2600 and 7800 games at O'Shea Ltd. And guess how much. 80 cents. That's right only .80 for new unopened Atari 2600 and 7800 titles. Only several titles are available.